Corning, Calif., native Tyler Reddick, rookie driver of the No. 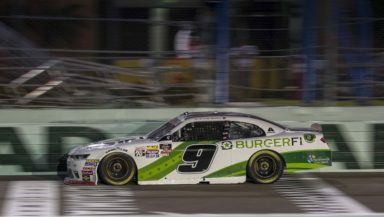 9 BurgerFi/Nationwide Children’s Hospital Chevrolet for JR Motorsports, clinched the 2018 NASCAR Xfinity Series championship after winning the Ford EcoBoost 300 at Homestead-Miami Speedway. This marks Reddick’s first national touring series championship and the third in five years for JR Motorsports, the company owned by Dale Earnhardt Jr. Reddick held off fellow Championship 4 contenders Christopher Bell, Cole Custer and Daniel Hemric in the final race to earn the title. MAKING HIS NAME: Reddick becomes the 29th different driver to win a NASCAR Xfinity Series championship in its 37th season. A HAT-TRICK FOR JRM: JR Motorsports’ third NXS championship in five years comes in its 13th season in the series. Chase Elliott brought home JRM’s initial NXS title in 2014 and William Byron scored the organization’s second in 2017. This year’s championship marks the second consecutive NXS title for JRM with its No. 9 team. The company started competing full time in the NXS in 2006 (it entered one race in 2005), and has amassed 44 victories to date. Complementing Reddick’s season-opening victory at Daytona International Speedway and his dramatic win in the season final at Homestead-Miami Speedway, teammate Justin Allgaier also claimed five wins and took home the regular-season championship. JRM ROOKIE RECORD BOOK: Reddick entered Homestead tied for the top spot in the 2018 Sunoco Rookie of the Year standings, and should he win, he’d become only the third driver in any NASCAR national series to win the championship and rookie of the year in the same season. Chase Elliott was the first to accomplish the feat during his JRM stint in 2014 and William Byron followed suit in 2017. The award’s winner is not determined until the end of the season because its format factors off-track merit as well as on-track performance. A FIRST FOR BURGERFI: Reddick’s title also gives BurgerFi its first championship in NXS competition. Founded in Lauderdale-By-The-Sea, Fla., BurgerFi is one of the fastest-growing restaurants, with more than 100 locations across the U.S. and beyond. BurgerFi has been a supporter of Reddick through his climb from the NASCAR Camping World Truck Series to the NXS. THE TALE OF THE TAPE: Reddick’s initial NXS championship comes on the heels of a season that included two wins (Daytona International Speedway and Homestead-Miami Speedway), seven top-five and 20 top-10 finishes. TWICE AS NICE: This marks the second championship for Dave Elenz as a crew chief, but he’s no stranger to championship successes. Elenz also scored a 2013 NASCAR Cup Series championship as lead engineer on the No. 48 team with Hendrick Motorsports. Elenz joined JR Motorsports in 2014, calling the shots for four victories with the company’s “All Star” car before being tabbed to lead William Byron and the No. 9 team to his first NXS championship in 2017. In 2018, Elenz earned his second consecutive championship as crew chief, guiding Tyler Reddick to a season-opening victory at Daytona International Speedway en route to the title. With tonight’s win at Homestead-Miami Speedway, Elenz becomes the all-time leader in crew chief victories for JRM with 10. POST-SEASON PROWESS: Reddick successfully maneuvered through all three rounds of the NXS Playoffs in order to secure his first championship, amassing an average finish of 6.2. Reddick earned a berth in the Playoffs early, claiming his spot on the strength of a season-opening victory at Daytona International Speedway. He led the championship standings for two weeks and remained a strong playoff contender throughout the regular season, notching four top-five and 14 top-10 finishes during that span. Once the playoffs began, Reddick found a level of consistency that allowed the 22-year old driver to advance from the Round of 12 into the Round of 8. The 2018 Rookie of the Year contender continued his uniformity through the Round of 8, earning a second-place finish at Texas Motor Speedway and a sixth-place effort at ISM Raceway which propelled him into the Championship 4. Jimmie Johnson (El Cajon, Calif.), a record-tying seven-time NASCAR Cup Series champion and winner of 83 Cup races. 2019 NASCAR Hall of Fame inductee and four-time NASCAR Cup Series champion Jeff Gordon (Vallejo, Calif.), winner of 93 Cup races. Two-time NXS champion, 2014 NASCAR Cup Series champion, winner of 47 NXS races and 45 Cup races, Kevin Harvick (Bakersfield, Calif.). RAISING A GLASS TO DALE JR.: Reddick’s championship marks the fifth for Earnhardt Jr. as a team owner and third in five years at JRM. His first company, Chance 2, won championships with driver Martin Truex Jr. in 2004 and 2005 in partnership with Dale Earnhardt Inc.
WINNING WITH CHEVROLET: Reddick’s championship in the No. 9 BurgerFi/Nationwide Children’s Hospital Chevrolet marks the 20th time a Chevrolet driver has won the NXS championship. Former JRM driver William Byron was the last to do so in 2017. The Bowtie Brand also clinched the Bill France Performance Cup in NXS competition this year, giving the manufacturer the honors for the 19th time, more than any other manufacturer. AXALTA PAINTS CHAMPIONS: This marks the third championship for Axalta under the JRM umbrella. Axalta, a leading global provider of liquid and powder coatings, has partnered with JR Motorsports since 2008 and supplied paint for all of the organization’s victories as well as its newly minted third championship. CARRYING ON THE HENDRICK TRADITION: Reddick becomes the seventh driver to win his first NASCAR championship with Rick Hendrick, co-owner of JR Motorsports, joining William Byron, Chase Elliott, Jeff Gordon, Jimmie Johnson, Jack Sprague and Brian Vickers as first-timers. HENDRICK HORSEPOWER: This is the 21st NASCAR championship and fourth NXS championship for Hendrick Motorsports engines, which supplies motors for all JR Motorsports teams. Hendrick Motorsports engines previously won NXS championships with Brian Vickers in 2003, Chase Elliott in 2014 and William Byron in 2017.